In my last post, I laid out the basics of what this VCP certification guide guide is about and where it is going. Today, I’m going give you the down-and-dirty details, including overall approach, actual techniques, and what you’ll need to get going. But first- lemme take a selfie let me show you the difference between strategy and tactics. Strategy and tactics are 2 different things, but if you want to be successful, whether in battle or in goal setting, they need to align. Strategy is your overarching plan. It the the high-level, 30,000 ft. view of your mission. It doesn’t deal with details. It’s just a broad direction for you to go in. Tactics, on the other hand, are what you employ when you are on the ground doing the work. Tactics are your techniques, steps, and all the little details that get the job done. My strategy here is actually straightforward- I am going to learn the heck out of vSphere 5.5 and 6. I will do this the old school way, just by learning the material and using it at home and at work. I will be virtually attending Stanly.edu’s VMware IT Academy class for VCP5.5. Great question. It’s about money and the way I like to learn. VMware will let you take the VCP exam(s) without the class, but in case you didn’t know, you won’t get VCP certified until you take one of their approves classes. For me there are 2 upshots here: I get to take the class at my own pace and it’s wildly less expensive. You can have your company pay for the week-long VMware class, but for me, I get 45 days to do exercises and an inexpensive class with some guidance. Works for me. I will use books, videos, classroom training, and even teaching it to others to learn it. Wait – what? Teach it? That’s right. You are a better student of something if you are going to have to teach it. This served me very well when I took my previous certification exams. I was in a tech school for about 6 hours per day, and I actually would learn for 3 hours, then after lunch do to an empty class across the hall and me and some friends would take turns teaching the concepts to teach other. I don’t think there’s a better way. If you can explain the concept to someone else, you are close to mastering it. I don’t have a class this time, but I’m considering starting a Google Hangout and teaching it there to others. Maybe I’ll even do it on Periscope. Not sure yet. If not, I can still teach the concepts to my fellow engineers at work. I will take the classes and do the labs on Tuesday nights, and also Wednesday if needed. I let my wife and coworkers know what I’m going, so they will keep me accountable. I set dates for most of it. Request authorization for VCP 5.5 Exam + pay $225 (USD) – Schedule for 12/22/2015. You can’t get something as ambitious as this done without tools. Tools multiply your force and productivity, and they are essential to you getting this certification. Note- some of these are affiliate links- meaning I may get a small commission at no cost to you if you buy from here. I’ve actually used all of these items. Practice exams from MeasureUp ($139). 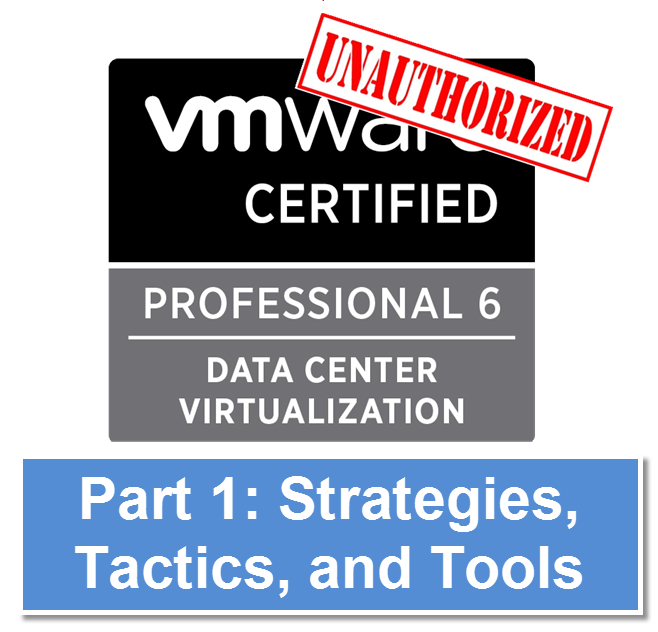 There you have it- I’ve opened up my playbook, and now you have my strategies, tactics, and tools for getting VCP6. It’s a bit unorthodox in some ways, but I will feel very confident in both my testing and the knowledge I will have afterwards to serve me well. I am starting the Stanly.edu tonight! I will be sure to grab some good notes and other information for you for next week. I will also go into detail about how the class works and what to expect. If you want to stay on top of this series, make sure you subscribe at the top of the screen and in the right sidebar so I can get you email updates. Reach out on the social channels, too! Let’s chat about it. Sorry I still don’t get why 5.5 before 6? Is it mandatory or can I just take vcp 6 training from Stanley and be vcp certified after the exam? Great question! At the time I wrote this series, Stanly was only offering 5.5. They just moved to 6.0 a couple of months ago. If you take the Stanly 6.0 Install, Configure, and Manage class, you will become VCP certified after taking the exam. Great question! Stanly was only offering ICM (Install, Configure, and Manage) 5.5 at the time I wrote this. A few months ago, they started offering 6.0. If you take ICM 6.0, then get Exam Authorization, then take and pass the Exam, you will be VCP certified. So no, you don’t need to take 5.5. It’s just what was available.